С этой страницы вы можете получить доступ к документам (книги, статьи, видео) необходимым для изучения курсов историко-математической направленности. Для удобства использования все материалы разбиты на разделы, которые в свою очередь делятся на более мелкие рубрики. В каждой рубрике материалы упорядочены по алфавиту авторов (сначала зарубежных, а потом отечественных). Библиотека будет постоянно развиваться и пополняться. Для удобства перемещения внутри медиатеки используйте навигационную цепочку в верхней строке. Материалы медиатеки предоставлены в качестве ознакомления для использования в образовательных целях. Владельцы ресурса не претендуют на авторские права. В случае противоречий по поводу размещения со стороны авторов просим связаться с администрацией ресурса по e-mail: pyrkovve@yandex.ru. The battle over the calculus. Professor Marcus du Sautoy reveals how the great hero of British science is rather less gentlemanly than his German rival. An astronaut and investment analyst pay homage to the enormous power of the calculus. The man who calculated as other men breathe. Professor Marcus du Sautoy on the mathematical omnivore without whom no history of mathematics is complete. Professor Marcus du Sautoy describes the life and mathematics of this Napoleonic soldier, with contributions from musician Brian Eno who loves Fourier's analysis and uses it to create sounds that have never been heard before. Professor Marcus du Sautoy on his favourite mathematician, an angry, young genius who did his best maths in prison and died in a duel, aged 20. The 19th century mathematical celebrity. Professor Marcus du Sautoy describes how a study of asteroids led Gauss to describe the normal distribution. With contributions from Chairman for the Commission for Racial Equality Trevor Phillips, who believes statistics are the most powerful weapon we have for fighting prejudice. Seeing in four dimensions. Professor Marcus du Sautoy on the pioneers who pushed mathematics into new dimensions and the strange new geometries they created. Emeritus Professor Roger Penrose confirms that even Einstein sometimes struggled with his maths. Infinity. Professor Marcus du Sautoy describes the troubled life of this radical mathematician who shocked his colleagues by proving there's more than one infinity. With contributions from Emeritus Professor of Mathematics Roger Penrose. An embarassing error and the mathematics of chaos. Professor Marcus du Sautoy describes how a mistake in Poincare's working led him to an astonishing conclusion: some mathematical problems don't have a reliable solution. A mathematical romance. Professor Marcus du Sautoy describes how a passion for prime numbers united a Cambridge professor and an unknown Indian clerk. The mathematician that never was. 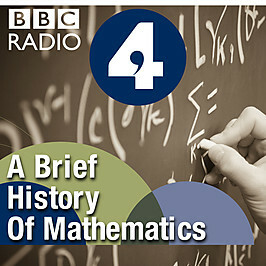 Professor Marcus du Sautoy describes the life and mathematics of an elusive hero. The collected works of Bourbaki represents one of the most ambitious enterprises in mathematical history: an attempt to unify shapes and numbers into single discipline.